With the ubiquity of personal electronic devices, healthcare workers are all too commonly performing workarounds—alternatives to approved workflows that bypass their organizations’ privacy and security measures. Exacerbating this problem is the unapproved use of powerful consumer-accessible applications, many of which ...healthcare workers access via personal devices. Workarounds compromise patient data privacy and security, and resultant breaches compromise healthcare organizations’ reputations and lead to fines for U.S.-based companies under the HITECH Act’s protection of HIPAA-covered entities. Furthermore, because workarounds typically involve third-party data stores—often in place of approved containers—they can also compromise the integrity of patient records stored within electronic health records (EHRs) and health information exchanges (HIEs). Despite these risks, most healthcare organizations are still facing the frequent use of workarounds, according to a January 2013 Intel-sponsored survey of healthcare workers. To investigate continuation of the workaround trend, Intel sponsored HIMSS Analytics to conduct a follow-up survey in January 2014 of 433 healthcare workers, 90 percent of whom practice in North America and 60 percent of whom work in organizations of 500 or more employees. Forty-seven percent of physicians, nurses, Information Technology directors, administrators and other healthcare employees surveyed said workarounds occur in their organizations “sometimes” or “every day,” while only 15 percent said they never occur. This constitutes only a 4 percent reduction in the use of workarounds from the prior year. 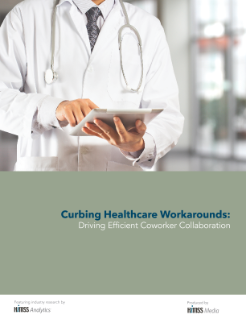 Read the full Curbing Healthcare Workarounds for Coworker Collaboration Report.